Yes, a hamburger loco moco for $1.90. 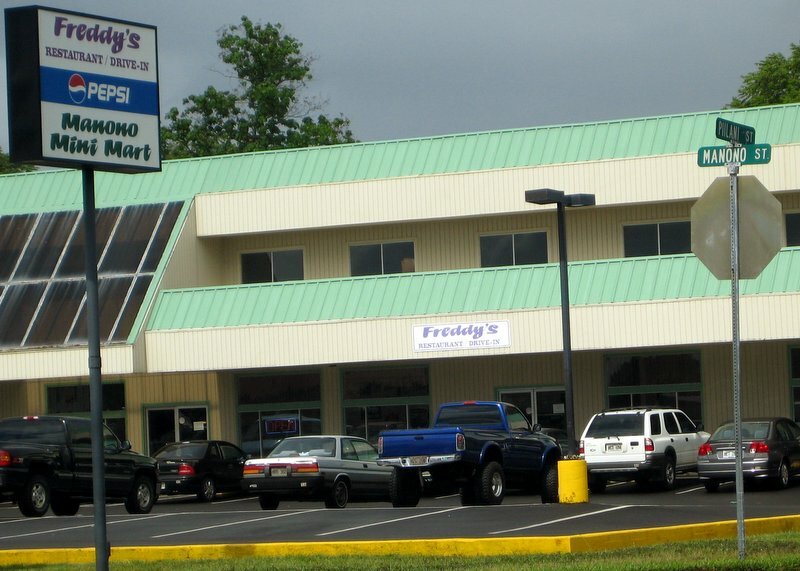 Freddy’s has got to have the best loco moco value in Hilo! 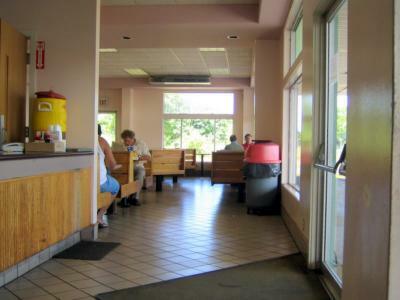 Freddy’s has a nice eating area with big windows providing lots of natural light. 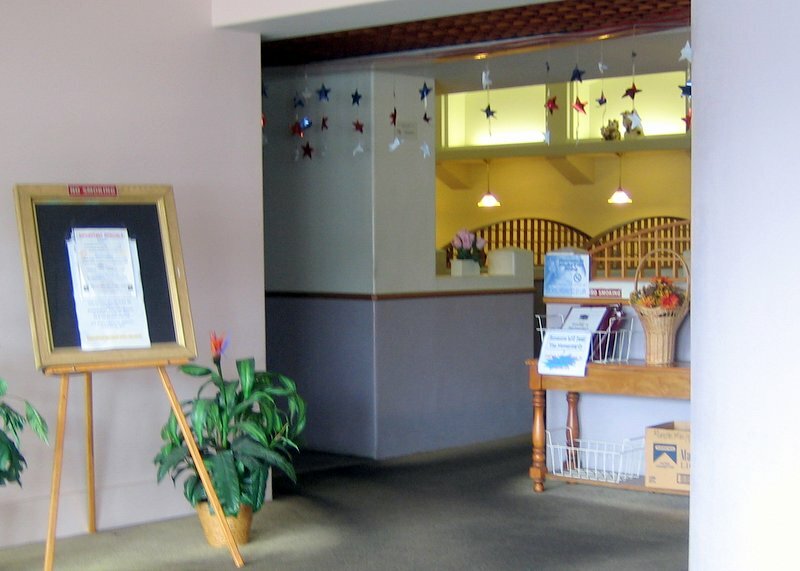 The service was very friendly and quick. 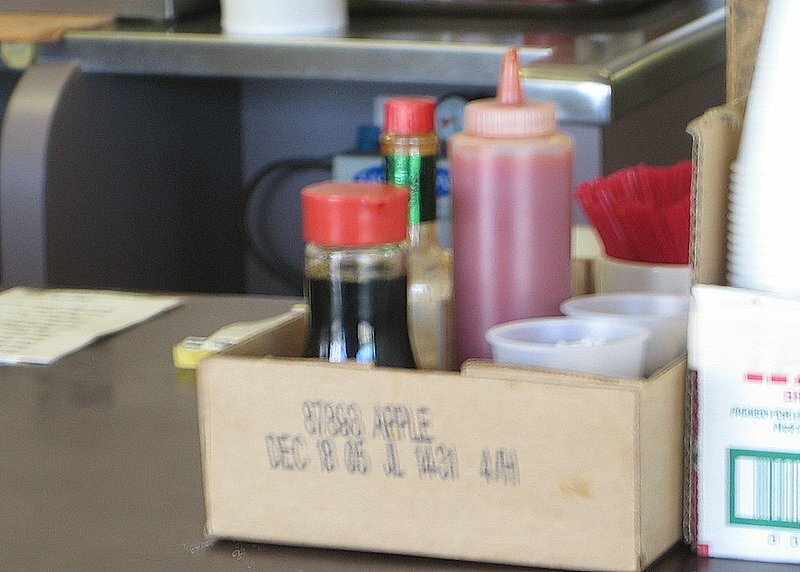 Slide your plate a little to the right and the loco moco condiments are right there. You gotta put on da shoyu, ketchup, and tabasco, or you’re not having the full loco moco experience! Burger: Good size and taste was good. Based on the texture I could tell this was a premade burger, but it still tasted good in the overall picture. Gravy: Standard brown gravy. Good amount given. Flavor was nothing special, but it was just right. Egg: Perfectly cooked nice quality egg. Rice: Good rice! Cooked just right. Freddy’s loco moco is a very decent loco moco. 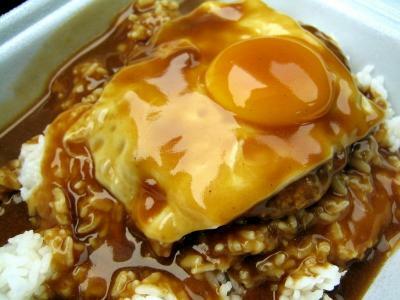 They cut some corners to make it cheaper (like the burger), but the beauty of a loco moco is that it is a cheap, fast, and satisfying meal. 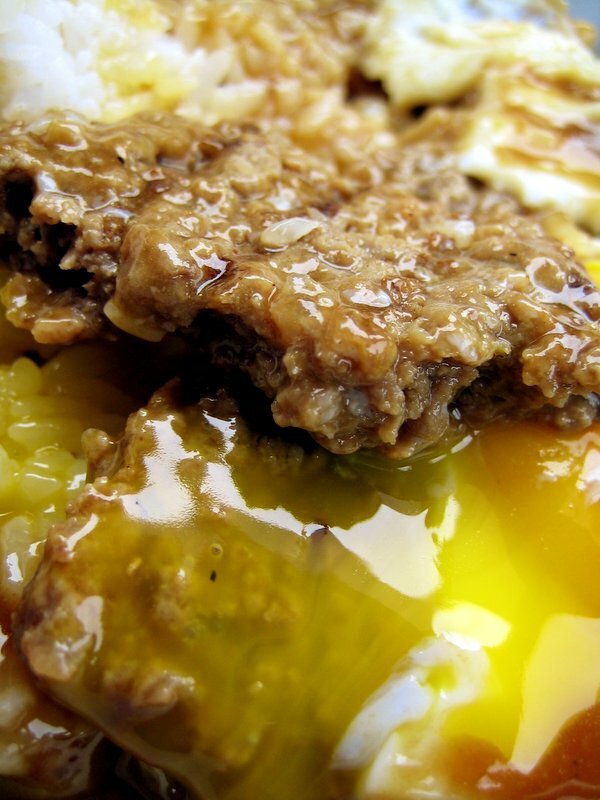 So, this is a perfect representation of the essence of a true loco moco. For those who want to dine in, Freddy’s has a restaurant area on the side. 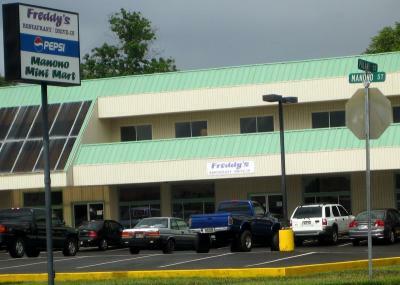 Freddy’s is also famous for their sandwiches, which are very big, fresh and delicious. Their plate lunches are also very good. I hope to feature more food from here in the future. This entry was posted by James on Friday, August 19th, 2005 at 11:34 am	and is filed under Hilo, Loco Moco, Restaurant Reviews. You can follow any responses to this entry through the RSS 2.0 feed. You can leave a response, or trackback from your own site. James – Another nice loco. A buck ninety, gotta be the cheapest price for a loco, I’ve eva’ seen! brah….i still wondering what u get fo drink wit all dis. I hope is one jumbo fruit punch brah! Kirk, same here, i wonder if it’s the cheapest in Hawaii? Kelly, I drank a diet coke w/lime. I stay try watchin my figure! A nice fruit punch woulda been betta tho! Hey James – I was thinking, hey what about tax and remembered it’s only 4% back home – so it’s still under two bucks…here in SoCal it’s 7.75% – so it’ll be over two bucks! Not that it would be much of a difference…..
wow da prices on da menu look like back in da 70′s!! wish was like dat hea on Oahu!! look at da loco moco!! i stay drooling already i like pop dat egg yolk!! whea mah tabasco!!! Thanks for telling me about this place. It made a great stop for a post-Big-Island-Intl.-Marathon treat. The chili-Portugese hot dog plate (a special) was good, but the teri burger so-so (meat a little dry & gristly). Standard American fast-food items ordered by rest of our party passed muster. Hi there…Man i love reading your blog, interesting posts ! it was a great Wednesday . in high school wen school let out, me and my friends went from waiakea to go eat a loco before soccer practice almost every day. to this day, i still go to freddy’s for a loco when i come visit home. usually the da first thing i do when i get off the plane is go there for some lunch. My brother told me about Freddy’s. I got to try Feddy’s Loco Moco, when we family takes our “frequent” Hilo trips again, in November. 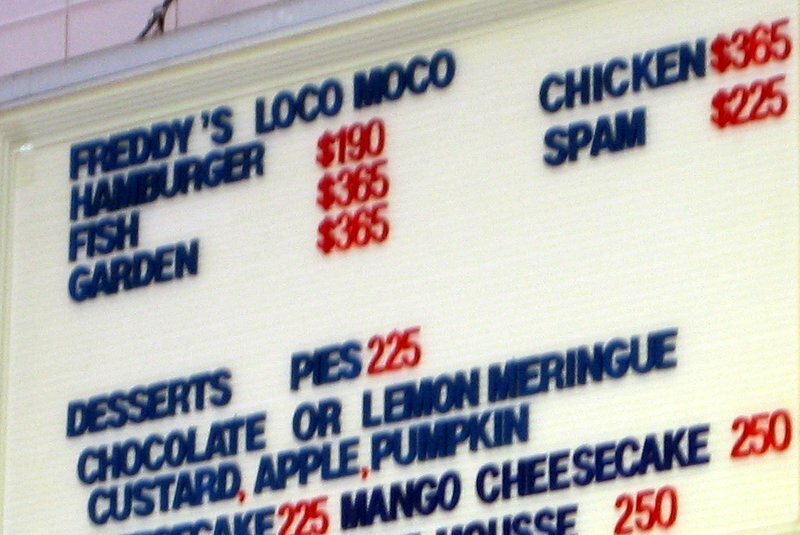 I got to try Freddy’s, but I forgot to order the loco moco. I thought it was just a drive in, but there’s a restuarant on the left side. The entire place is enclosed and air conditioned. The drive in prices are VERY REASONABLE. No wonder many of the Hilo folks go there. Reading byat nearsooner thanby means of means of your enjoyable postdespatchenterlist inform, willwill-powerinclinationdesire assisthelpfurtherabet me to do so sometimes. Fabulous work and much success in your business dealings!the article is in reality the best on this valuable topic. Hey i did enjoy your blog i think it was pretty informative . Let me know if you have any future updates thanks . I’d have to check with you here. Which is not something I typically do! I enjoy reading a post that may make people today think. Also, thanks for allowing me to comment!